Sorry for the delay in sending the ride report for Huron Chapter’s Brouse’s Beach Brouser 600km Event that was held Saturday, June 23 this year. Hope you enjoy our story as much as we enjoyed this event. Congratulations to Chappy, Chris Cossonnet, Ken Jobba, Matthew McFarlane, Terry Payne, Jim Raddatz, Sergii Tsymbal and Don Williams for successfully completing this 600. Brouse’s Beach Brouser 600 started at 5am from the Tim Horton’s in Goderich Saturday morning. 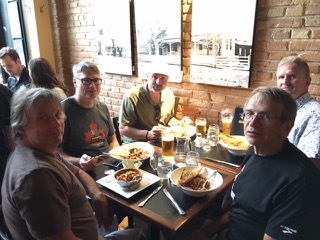 The night before, Chappy made dinner reservations at the Black Dog Village Pub & Bistro in Bayfield where 4 Randonneurs joined him … Terry Payne, Don Williams, Chris Cossonnet and Ken Jobba. A few made the comment that they loved the place so much they couldn’t wait to bring their wife back to the Black Dog one day soon! The next day, everyone showed up at the Tim Horton’s in time for the 0500hr Start. 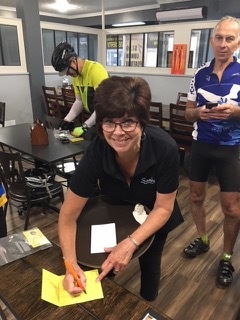 Liz Overduin volunteered to support the Randonneurs throughout the 600 and delivered baggage to controls where plans were made to stop and sleep. John Maccio lead us on a great pace for the first 5 km. About 60 km from the start, a farm house with a straw roof was seen! Everyone arrived at the Control, Sandy’s Family Restaurant in Mildmay, within 30 mins of the opening time! The majority of us enjoyed breakfast, a coffee or two, then headed out. Now, if you check out the profile for this 600, you’ll easily see that 90% of hill climbing happens in the first 300 km. OUCH!! 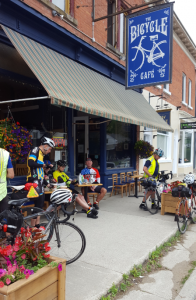 Arriving at the Second Control, the Bicycle Cafe, Flesherton, Ontario, one of our Randonneurs mentioned how tough the climbing had been. Having done this Brevet before, Chappy knew the worst was yet to come and didn’t say boo! Everyone enjoyed an incredible lunch before heading out. 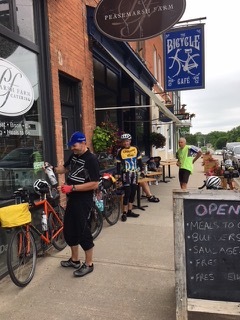 Chris Cossonnet, Sergii Tsymbal and Jim Raddatz out in front of the Bicycle Cafe. 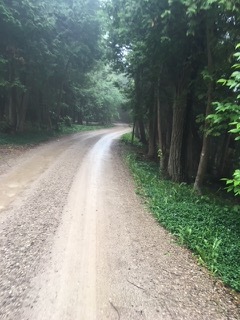 The second major climb happened at Blue Mountain’s Scenic Caves Road, 216 km into the Brevet. All we could say was … Who’s Your Daddy! Once at the top, the majority of our climbing was complete. 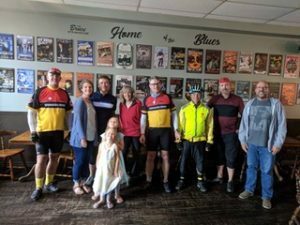 On route, the Randonneurs went through Meaford and Owen Sound towards the two sleeping controls, Waterview Inn on the Bay (Wiarton) and the Lion’s Head Inn, Lion’s Head. Since the Lion’s Head Inn was not open or available, control cards were signed and a half dozen Randonneurs headed to the Fitz Hostel in Lion’s Head to use as their sleeping location. Day 2 had Randonneurs who rested in Lion’s Head, doing 227km to the Finish. Sergii Tsymbal decided not to stop at the Fitz Hostel, continued throughout the night, grabbing short naps to the finish. John Maccio and Matthew McFarlane had planned on crashing in Wiarton at the Waterview on the Bay Resort (control) but John simply called it a day in Meaford which left Matthew on his own. Being Matthew’s first 600 attempt, the Randonneurs Chappy was with, were all concerned, but simply said “Welcome to Randonneuring Matthew!” Chappy suggested to Matthew that he make it to the Fitz Hostel in Lion’s Head by 0600hrs Sunday morning, to join his group. 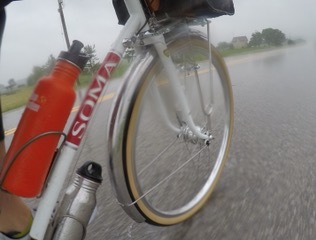 Now pedalling from Owen Sound along the Bay to Wiarton, then along the Bay to Lion’s head, FOG was everywhere making the Rear lighting on everyone’s bike IMPORTANT! It was perfect seeing that everyone had 2-4 rear lights ON! 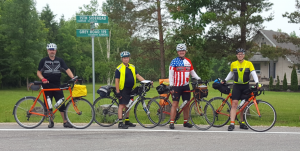 At 0545hrs Sunday morning, Chappy’s group of six were getting ready to head out for the last 227 km to the finish and wondering if Matt was going to make it on time. Chappy was one of the first Randonneurs that got up early … but trying to get down from his top bunk … had a hamstring leg cramp … bit his tongue trying not to wake anyone else up … sorry Gents! Once everyone was up and ready to go, they looked down the street and there he was … Matthew pedalling towards us! We all laughed and congratulated Matt on his accomplishment!! We asked what time he made it to the Waterview on the Bay Resort, the Wiarton Control where John and himself had planned on getting a few hours sleep. 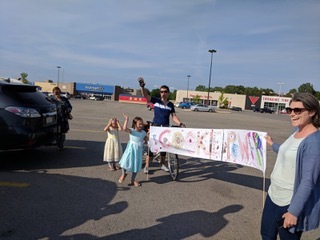 He let us know how he was exhausted and found a cheap $50 hotel in Owen Sound, stayed there for 1 hr before getting back on his bike, made it to the Wiarton Control on time and then the Lion’s Head Control on time. AWESOME PERFORMANCE MATT! Leaving Lion’s Head had Great Scenery along the way to Sauble Beach. A few Randonneurs mentioned how much they loved the gravel roads, fortunately no rain had happened! Don Williams would lose everyone on climbs … large or small … then catch up and pass on flats. Fellow Randonneurs kept asking Chappy how he could accomplish this. With only a few hours sleep, Chappy let them know Don and his wife have two Mountain Climbing Training Centres downtown TO and were mountain climbers themselves, then suggested Don must thinks his hands will help on the climbs! Don sent us a great picture of the Southampton Lighthouse. 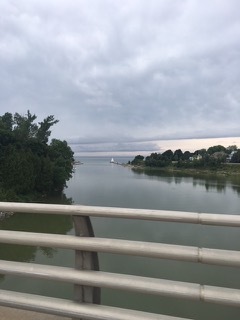 From Sauble Beach to Kincardine, road conditions were perfect. Unfortunately, it started to pour RAIN! Check out Matthew’s picture. Misty to say the least! 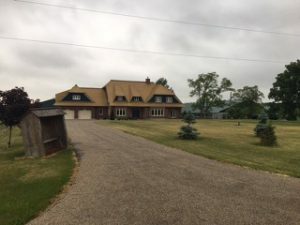 The next control was in Kincardine, Ken Jobba had been riding with Chappy’s group since the start and let Chappy know he was hypothermic and had to take off to warm up. Chappy’s Randonneurs decided to have a 20 min break at the Bruce Steak House, Kincardine after having their control cards signed at the Tim Horton’s. Well, that 20 min break turned out to be just over an hour! The McFarlane Family, John Maccio and Liz Overduin met the group there. From left to right, Chappy, Matthew, his wife and daughters, Liz Overduin, Don Williams, Terry Payne, Chris Cossonnet and John Maccio. Inside the Steak House and looking out, our group noticed the clouds starting to disappear! Once on the bikes and heading towards the FINISH… approximately 75 km away … SUNSHINE! Temperature 26 deg C! Jim Raddatz was one of the first finishers and let Chappy know that he had stopped with 20 km to go to take off his rain jacket, Ken Jobba briefly stopped to see if he was OK. When Jim looked up Ken was a speck on the horizon. Wow was he flying! The next day Jim’s e-mail let Chappy know he could barely walk! Just to let you know Jim … neither could any of us! Matthew’s Family was as excited as everyone else on the finish! Liz Overduin… Awesome Support! You’re a Great Organizer! John Maccio … You’re First Class! Thanks for taking the time to see how your fellow Randonneurs were doing!